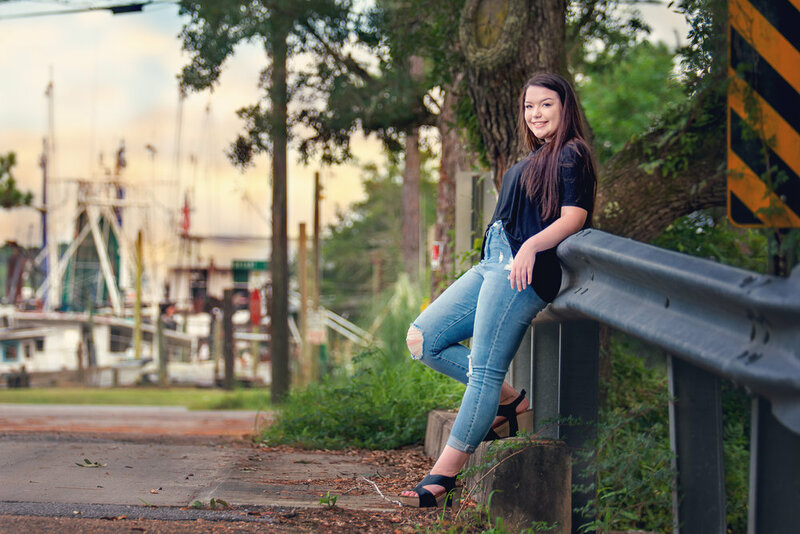 Ashlynne’s session was shot in Bayou La Batre, which is my home town. This is my favorite session to date because of all of the elements that remind me of my childhood. We started her session on my grandparents old street. Before Hurricane Katrina destroyed our town, that was their home. It’s just an empty road with overgrown land but being there still brought back tons of memories. We then went just a quarter of a mile down the road to an old bridge as well as an old vacant lot that belongs to one of Ashlynne’s family members. In the background of both of these locations is my great grandparent’s and grandparent’s old oyster shop. I have lots of memories watching my grandmother open oysters and seeing my grandfather washing them. We finished the session on Dauphin Island but due to stormy weather we had to cut it short because it was getting too dark. I can’t wait for part two of this session! It’s incorporates something I’ve never done before and I don’t think has been done for a Senior Portrait session before either, which is even more exciting.